This is where it all started. Portland was born in 1843 when William Overton and A.L. Lovejoy stepped ashore and claimed the area now known as Old Town Chinatown bounded by NW Broadway to the North and West, SW Stark to the South and the Willamette River to the East. With the discovery of gold in California in 1849, immigrants from across America and Southeast China flocked to Portland, then the largest hub of commerce and trade in the Northwest. Many remnants from those early days still remain including the 2nd largest collection of cast iron buildings in the US and Skidmore Fountain, Portland’s oldest piece of public art dedicated in 1888. Today Old Town Chinatown has five district quadrants – Ankeny Plaza, Chinatown, Japantown, Skidmore and Waterfront – and remains a bustling hub of activity. The combination of tech, arts, culture and history have created a vibrant neighborhood business district unlike anything seen in the city before. Venture Portland sat down with the leaders of the Old Town Chinatown Community Association (OTCTCA) to talk about what they love about the district and why they are proud to call Old Town Chinatown home. Helen Ying is President of OTCTCA and has served on the Boards of various other non-profit organizations including the Chinese American Citizens Alliance and the Asian American Youth Leadership Conference. 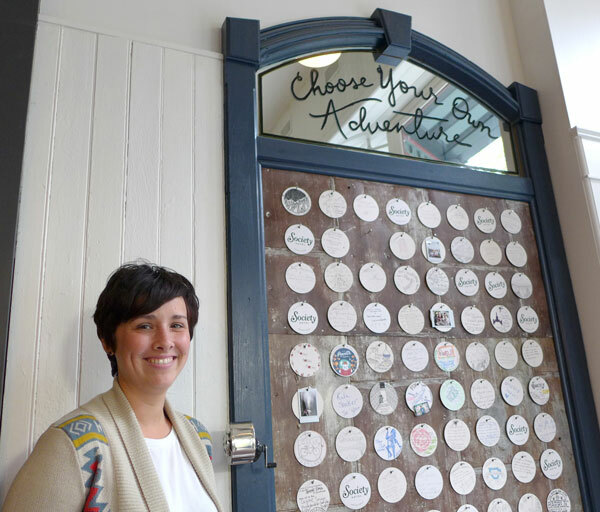 Jessie Burke is Vice President of OTCTCA and co-owner of the Society Hotel, Old Town Chinatown’s newest boutique hotel in a renovated 19th century lodging house for sailors and Owner of Posies Bakery & Cafe, which serves up coffee, tea, pies and cakes in a kid-friendly setting. What is your favorite thing about Old Town Chinatown? Jessie: What’s fascinating to me is that Old Town Chinatown is where Portland’s downtown used to be. When Portland started this was the epicenter of everything and I feel that in many ways it still is. People are starting new businesses and the tech industry is moving in and there’s lots of development within a relatively small area. There are so many beautiful buildings and many are in the process of being restored to their former glory. Helen: We have two registered historic districts within our business district – New Chinatown, Japantown and Skidmore Fountain/Old Town, which can’t be found anywhere else in the city. The Portland Saturday Market is right in our district and it attracts more than one million people to the area each year. Our district also offers services to some of Portland’s most vulnerable populations. Lives are being transformed right here in our district. We also have a lot of cool businesses in the district. 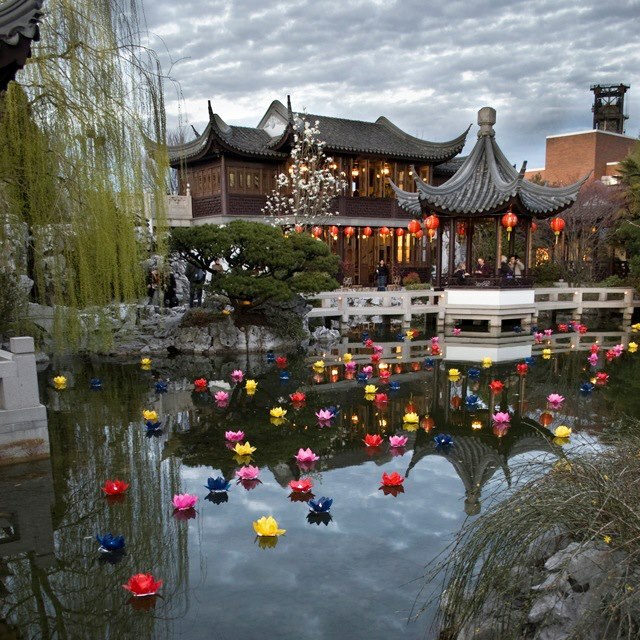 My favorite is the Lan Su Chinese Garden. No matter when you go, you’ll find something new because it changes with each season. I am also so proud of the Chinese restaurants that have stayed in the district – Chen’s Good Taste, Golden Horse Seafood Restaurant, Red Robe Tea House and Café and Mandarin House. Jessie: We also have a lot of amazing crafters here like Orox Leather, Portland Pedalworks and Pensole Footwear Design Academy. Helen: Our neighborhood is unlike any other. We have Innovative Housing, who recently restored the historic Erikson Fritz building. There are so many cool talents here like the Northwest Evaluation Association which helps educators asses the effectiveness of their classrooms, Northwest Health Foundation which helps advance, support and promote the health of Oregonians, Mercycorps Northwest and don’t forget Airbnb! Their office is the coolest. Portland Saturday Market is the largest continuously operating open-air arts and crafts market in the country. Since 1973 the Market has delighted visitors with locally produced arts and crafts vendors every Saturday and Sunday March through Christmas Eve. Lan Su Chinese Garden was built by artisans from Portland’s sister city Suzhou and is one of the most authentic Chinese gardens outside of China. The Garden’s name translates to “Garden of Awakening Orchids”. 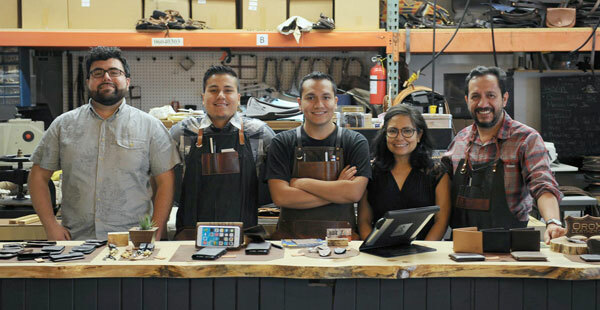 Orox Leather was founded by a 3rd generation leather crafter who began selling sandals at Portland Saturday Market. The company soon began crafting purses, rucksacks, wallets and belts and opened a brick and mortar location in 2012 where visitors can watch the products being made and meet the makers. Portland Pedalworks is an incubator for bike businesses including Cargo Bike Couriers, which uses cargo bikes for urban freight delivery; Petals on Pedals, which is Portland’s only bicycle florist and Icicle Tricycles which is famous for their custom ice cream bikes and coffee bikes. Pensole Footwear Design Academy was founded by a former Nike footwear designer who has designed more than 500 men’s and women’s styles including shoes for Michael Jordan, Carmelo Anthony, Derek Jeter and Roy Jones Jr.
Mercycorps NW provides, training, grants, loans and other resources to low-income, ex-offender and refugee small business owners in Oregon and Washington. Airbnb opened their Portland hub in 2014 in the historic Blagen Block building and features workspaces themed after real life accommodations found on their website. Old Town Chinatown contains a diverse mix of residential housing, businesses and non-profits including social services organizations that support Portlanders struggling with homelessness, addiction and mental illness. How has the district’s multicultural heritage shaped its current identity? Helen: The buildings that we have here, the limited development, that’s part of our history and they are protected, so you can’t just come in and knock them down. The OTCTCA aims to preserve the district’s history while at the same time focus on economic development. Jessie: Knowing that there’s such a long history of so many different groups, everyone actually does feel some attachment. For example, there was once a Jewish community here and now we have the Oregon Jewish Museum and Center for Holocaust Education which was previously outside the district but wanted to return. They were able to raise the money to buy a new building in just two weeks. Everyone feels some vested interest in being in this neighborhood. Helen: On 2nd Avenue you have the Oregon Nikkei Legacy Center which tells the history of the Japanese Americans. People can come here and learn about history as well. There are also plans to build a Chinese museum in the near future. Oregon Nikkei Legacy Center is located in the Merchant Hotel building which was built in 1880, in what was Portland’s Japantown (Nihonmachi) until World War II. In the early years, the building housed a laundry, bathhouse and barbershop which were run by Japanese families. The Oregon Maritime Museum can be found floating in the Willamette River adjacent to the district in the only remaining steam-powered sternwheel tugboat in the United States. The museum features ship models, maritime artifacts and memorabilia relating to life on Oregon’s rivers in the turn of the 20th century. One of the most famous buildings in the district is Union Station which was built in 1890 and features a 150-foot Romanesque clock tower with a neon sign that reads ‘Go by train’. Located within the station is Wilfs Restaurant and Bar, which serves up local, sustainable American fare and live jazz. What makes Old/Town Chinatown a destination for arts and culture? Jessie: One of the main reasons crafters and artists moved here is because it was affordable. They wanted to be close to the city center but also have access to the highway so they can easily distribute their products. The Society Hotel recently hosted a bunch of young artists from Japan who were participating in an artist exchange with artists from Portland. They stayed at the Hotel for a month and gathered their creative ideas from our district. Lots of interesting art is happening in here. It also helps that we have the Pacific Northwest College of Art (PNCA). I recently went to an art opening there and they had all of these student artists exhibiting their work along with bucket drummers providing the soundtrack. It was encouraging to see that there is a young community in the district. If young artists congregate in a particular area, it will become a destination. Helen: The richness of this district is a natural draw. It’s just so eclectic and full of history. The Pacific Northwest College of Art was founded in 1909 as part of the Portland Art Museum. Now an independent educational institution, its main campus is housed in the historic Federal Post Office building which was built in 1918. Other educational institutions in the district include the Oregon College of Oriental Medicine which is a graduate school for Acupuncture degrees and the 1907 University of Oregon White Stag building, which provides an urban study environment for students and features a store that sells merchandise related to the University’s beloved Oregon Ducks football team. The building’s famous White Stag sign was installed in 1940 and has carried various messages throughout the years including ‘White Stag Sugar’, ‘White Stag Sportswear’ and ‘Made in Oregon’. During the holiday season the stag’s nose glows red ala Rudolph the Red Nosed Reindeer. Old Town Chinatown is home to a number of art galleries including Deadstock Coffee, a Sneaker Culture-inspired coffee shop and art venue; Duplex, which hosts contemporary exhibitions from emerging artists; Open Gallery, which specializes in contemporary paintings and sculptures; p:ear which builds positive relationships with homeless and transitional youth through education, art and recreation; Pony Club which showcases illustrators, cartoonists, and printmakers from all over the world and Sequential Art Gallery, which promotes comic book art and illustration. Arts and culture can be found around every corner in the district. Between NW 3rd and 4th Avenues, two block-long ‘festival streets’ have been designated for various outdoor events. 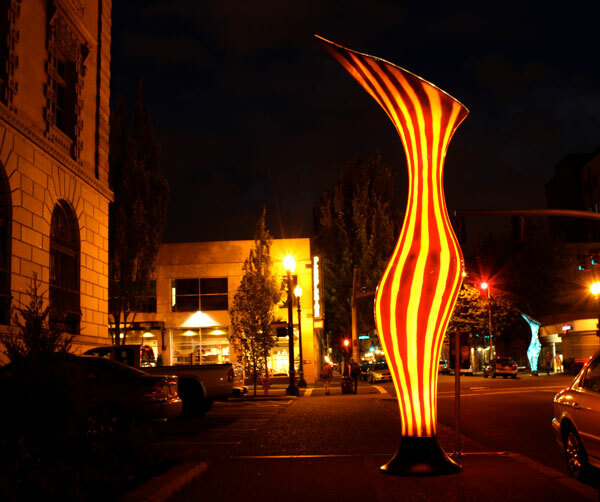 One of Old Town Chinatown’s most distinctive public art pieces is Nepenthes, a series of four sculptures inspired by carnivorous pitcher plants. The sculptures are solar powered and glow at night. Even lamp posts throughout the district have been painted red and gold in a Chinese-inspired style. What’s your favorite bit of Old Town Chinatown history or folklore? Jessie: The Society Hotel was originally built as a hotel for sailors in the 1800’s. At that time, there were men called Crimps who would work with boat captains coming into the port of Portland and offer to set the sailors up with food, lodging and other vices. They would show the sailors a great time until the Captain needed them back on the boat. However, they had no obligation to get back on the boat, except for the fact that they had secretly been accumulating debt with the Crimp. Since the sailors had little to no money, the only way to repay this debt was to return to the boat and have the captain pay off the debt. This process was called ‘getting Shanghai’d’ because when you got back on the boat, the port of Shanghai, China was the farthest place anyone went from the port of Portland. This process was happening in every building in Portland at the time, so the Society Hotel was built as a safe place for sailors to stay where they could avoid being Shanghai’d. The Society Hotel was restored to its former glory in 2015. During restoration, the building’s upper floors had not been touched since 1945 and many World War II era artifacts were discovered including furniture, kitchen appliances, garments and documents that have now been repurposed as decor. Today the hotel is LEED certified and features a café and lounge and rooftop deck with sweeping views of Downtown Portland. What would be your perfect day of food in Old Town Chinatown? Jessie: Bowery Bagels for breakfast. Their bagels are really good and the owner is from New York. He also runs Kitchen Cru, which does business development for some of Portland’s most well-known food industry businesses. I would eat at Bijou Café for lunch, they really have excellent food. Aprisa is also great. I’d take a tea break at Red Robe and then go to Old Town Pizza for dinner. They offer gluten-free pizza! Helen: I would go to the Society Cafe & Lounge for breakfast and Chen’s Good Taste for lunch. I would go to Golden Horse Seafood Restaurant for dinner; their menu is quite extensive and not limited to just seafood! Lechon is also a close second pick for dinner! Visiting foodies should also check out Pine Street Market, which opened in 2016 in the historic Carriage and Baggage Building which was built in 1886. 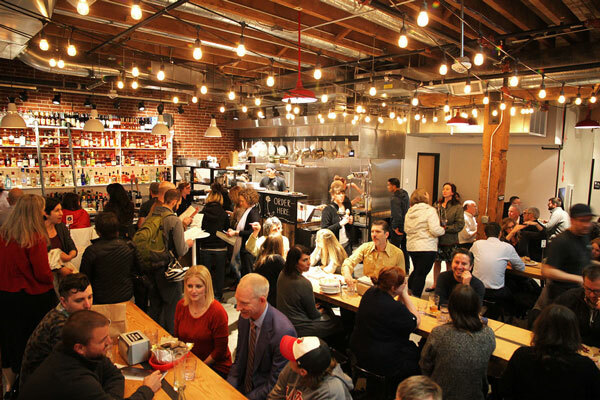 The market features some of Portland’s hottest restaurants including Kim Jong Smokehouse, which combines Korean street food with Southern BBQ; Marukin Ramen, which is one of the first US locations of Tokyo’s most popular ramen chain and Pollo Bravo which is a tapas bar featuring Spanish-style rotisserie chicken. How has the influx of creative and tech industry businesses influenced the district? Jessie: Since the tech businesses have moved in, there’s a lot more people out and about and you feel a lot safer walking around. It has also been great for businesses in the district. Helen: They really have enriched the fabric of the neighborhood. Tech companies that call Old Town Chinatown home include Airbnb, a vacation rentals website; Lytics, makers of a marketing and customer data platform; Netop, a worldwide leader in remote support software; OpenSesame, makers of e-learning courses; Puppet Labs, which specializes in automation software and ThinkShout, a website design firm. Jessie: Darcelle’s is a hidden gem for sure. It’s a drag club run by an 86 year-old drag queen named Darcelle. Everyone should totally go. She’s the hardest working person in Portland. She does a show every night of the week, and charms everyone in the process. She even remembers the names of everyone in the crowd and makes sure they are having a good time. Also the Nikkei Legacy Center doesn’t get nearly as much attention as it should. It’s really fascinating. You can go through and see the history of Portland’s Japanese community and how it was affected by internment in the 1940’s. There’s actually a movie about Japanese internment called ‘Come See the Paradise’ that was filmed in Old Town Chinatown on Third Avenue. Another one is Cal Skate. It’s a skateboard shop that has been in the district for 40 years. Any adults in the neighborhood who skateboarded as a kid got their first board at Cal Skate. The owner founded the OTCTCA. There are so many hidden gems. Darcelle XV Showplace opened in 1967 and owner and performer Walter Cole (alter ego Darcelle) was inducted into the Guinness World Records as the world’s oldest performing drag queen in 2016. She was also recently profiled by OPB’s Oregon Experience. Come See the Paradise, starring Dennis Quaid, was released in 1990 and tells the tale of a love affair during World War II and the internment of Japanese immigrants. TV show Grimm has also used the district’s historic US Customhouse as a filming location. Built in 1897, the US Customhouse was designated a historic landmark in 1970. Cal Skate was founded in 1976 by Portland activist Howard Weiner who recently retired after 40 years of running the shop and advocating for skateboarding in Portland. Wander south of Burnside and discover Ankeny Alley, a car-free street that features outdoor seating and various restaurant and nightlife options including Dan & Louis Oyster Bar, which has been serving signature seafood dishes since 1907; Valentines, which features live music, art, film screenings, poems and DJs and Shanghai Tunnel Bar, an underground bar with stiff drinks and pinball. Other hidden gems include Ground Kontrol Classic Arcade, which was founded in 1999 and features 60 classic video games and 27 pinball machines; Harvey’s Comedy Club which has been a Portland comedy destination since 1992 and features local and touring comedy acts and the Roseland Theater which was constructed in 1922 and hosted performances from Bob Dylan, Tina Turner, Miles Davis, Pearl Jam and Prince. What is the perfect souvenir for a visitor to Old Town Chinatown? Helen: There’s too many to name! Jessie: We worked with Liberty Bottleworks in Washington to have some custom-made Society Hotel water bottles with a ‘Choose Your Own Adventure’ theme. I sent them a bunch of photographs of Old Town Chinatown landmarks and they incorporated them into a design that really captures the unique aspects of the district. Many visitors to the district take home a signature pink box of Voodoo Doughnuts, a doughnut shop famous for off-the-wall creations like their maple bacon doughnut and voodoo doll doughnut. The shop has since expanded to locations in Denver, Colorado, Austin, Texas and even Taipei City, Taiwan. For the coffee lover, a bag of Portland’s famous Stumptown Coffee can be purchased at Stumptown’s Old Town Chinatown location and beer lovers can take home a growler of beer from Pints, Old Town Chinatown’s only brewery. If you’ve had your fill of delicious food and drink, head to the Pendleton Home Store and purchase a beautiful Oregon-made wool sweater or blanket. Jessie, as Vice President of OTCTCA, what is your favorite Old Town Chinatown accomplishment? Jessie: We received a Livability grant that helped us restore the Chinatown gate and lions that hadn’t been touched in 30 years. Over time the tiles began to fall and the paint started peeling so we brought in a restoration crew to bring them back to their former glory. We are also restoring the lamp posts throughout the district. Chinatown’s iconic gates at NW 4th Avenue and Burnside Street were erected in 1986 by the Oregon Consolidated Chinese Benevolent Association. The gates were crafted in China at a cost of $270,000 and are flanked by two stone lions. Another landmark in Old Town Chinatown is the historic Chop Suey Hung Far Low Cocktails sign which was constructed in 1916 and restored in 2010. Livability Grants fund projects that foster vibrant neighborhoods and are awarded by the Portland Development Commission (PDC), an organization which invests in job creation, innovation and economic opportunity throughout Portland. PDC’s office is located in Old Town Chinatown at the corner of NW 5th Avenue and Everett Street. Helen, as OTCTCA President, what future plans for the district are you most excited about? Helen: I am excited about the many developments including market rate housing and others that will add more foot traffic to the area. I am also excited about the redevelopment of the Broadway Corridor/USPS project. Jessie: We are currently building a volunteer group that will begin planning a signature district event. We have some really cool people that work in the district. It’s filled with DJs, muralists, restauranteurs and event planners who can help reinvent what the concept of Chinatown is. We are going to consider what is popular in Asian youth culture and work with young creatives to make something special happen here next summer. We want Old Town Chinatown to be a place where everyone comes together and celebrates.